Helen Simpson, from the Mushroom Shed, interviews Chris Kent and Cathy Romeo, from Eltham North. Abundance is the first word that comes to mind as I sit with Chris and Cathy at their shaded outdoor table and we talk about their garden. From this vantage point, I can see their prolific vegetable garden, with fruit trees cascading with an abundance of fruit. I’m wondering how they use it all. A backdrop of treed hills as far as my eye can see completes the splendid vista. Cathy, a teacher, tells me she grew up in an Italian family, with little interest in gardening, as that was her mother’s domain. 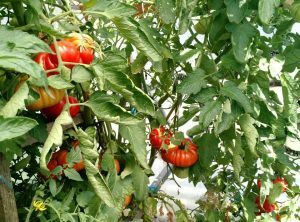 Veggies grew in the front yard as well as the back, which was unusual at that time, and her mother planted every centimetre, even the nature-strip. 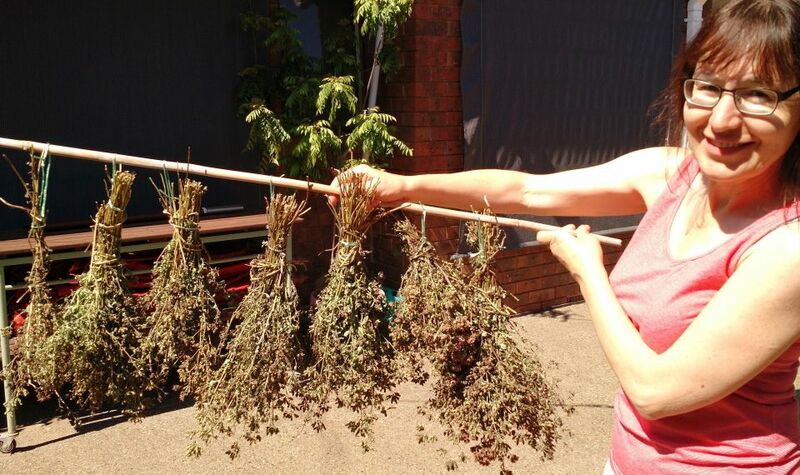 Indeed, her mother, at 91, had just been around to harvest Cathy and Chris’s oregano. 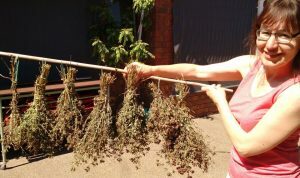 Cathy shows me a number of bunches that her mother tied with the stalk of the plant and bundled using traditional Italian methods. It was not until Cathy moved into her own home that the impulse arose to have a garden and grow fruit, vegetables and flowers. A more extensive flower garden is one of Cathy’s desires, as she loves having cut flowers inside the house. Chris works in the horticulture industry as a self-employed gardener and handyman, having made a complete change from an engineer in the IT industry 6 years ago. With courses and workshops, combined with a wealth of hands-on experience from horticulture work, Chris’s skills have been put to good use in their current Eltham garden. It is easy to see why Chris’s business is successful – his pruning skills are second to none and the huge volume of fruit trees that their ¾ acre supports are absolutely laden with plump, great looking fruit, including plums, persimmons, lemons, grapefruits, peaches, mulberries and figs. Chris prunes heavily to open up the trees to the sun and, in addition, ties the top branches down to open up the trees even further (see photo). It seems incredible that Chris and Cathy moved into their Eltham home only 5 years ago, given what their garden is producing. 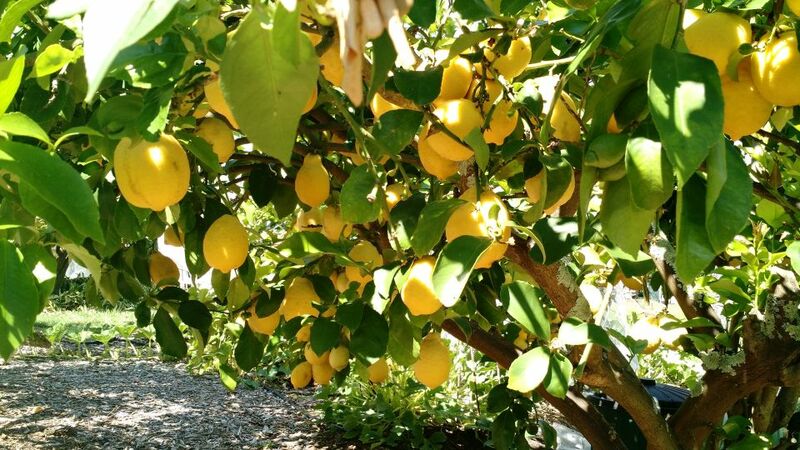 Originally the block supported mainly lawn, a few veggie beds, 15 fruit trees and exotic trees and shrubs. Since then, they have added 3 more larger veggie beds, one for annuals and the other two for herbs and perennials, with unusual varieties such as spaghetti squash, Richmond Green Apple cucumber, muskmelons and many varieties of beans supplementing the usual seasonal veggies. The fruit trees now number an incredible 60! The Fowlers Vacola preserving kit borrowed from Local Food Connect was extremely handy for preserving a lot of the produce; so handy in fact that Cathy has now purchased her own. 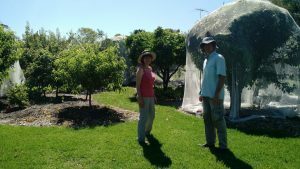 Chris and Cathy ‘bush mulch’ their fruit trees with wood chips (which need replenishing every 3 or so years) after spreading organic composted cow manure. This greatly improved the soil structure. Each season or growing period, the veggie patches are improved with home-made and bought compost, organic cow manure and work castings. 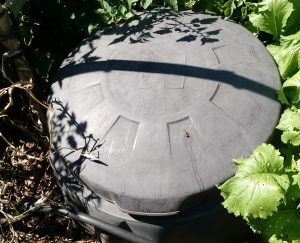 In ground compost bins, which are mostly buried in the soil, are a wonderful way to make compost, keeping the worms cool in summer and the rodents out. 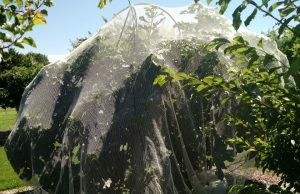 Apart from implementing a poly-pipe irrigation system, Chris and Cathy also net their fruit trees with a heavy duty net that doesn’t tear easily, to control destruction from birds such as cockatoos and Indian mynas. 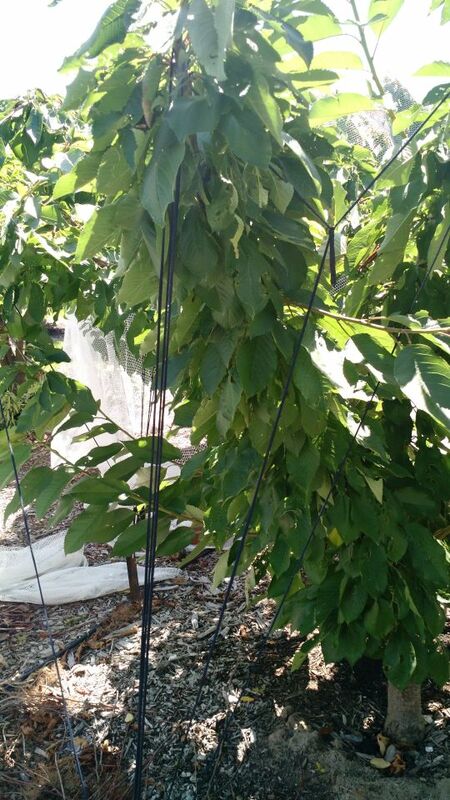 Hoop piping support the nets, with a 3 metre long pole in the centre, making them easier to install and remove each season without damaging the trees. 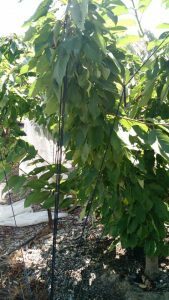 A rabbit-proof fence has been installed around the perimeter of their garden and, to keep the lush lawn out of the veggie beds and orchards, Chris has driven corrugated iron down 400mm deep around the edge of the beds. 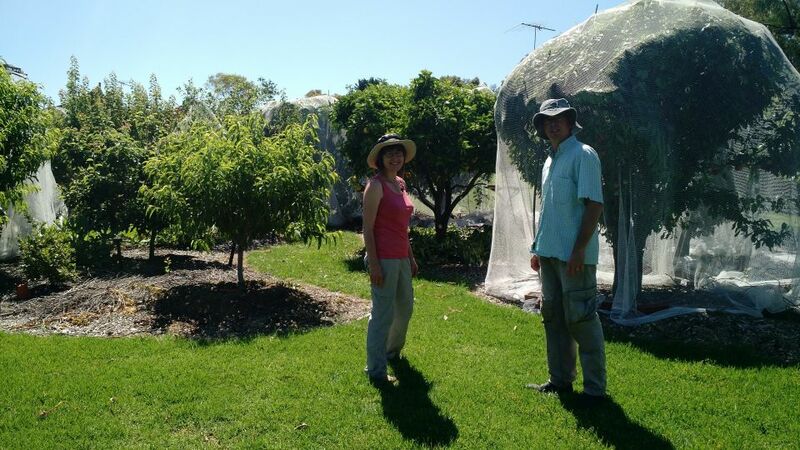 For the future, Chris and Cathy have the space to add significantly to their edible plants. However, with the current collection being more than adequate for their needs, any additions will be balanced against workload. Given Cathy and Chris spend time in their garden wherever possible, from an hour here and there to considerable bursts of energy, I’m sure if I returned in a few years’ time, I’d be seeing even more abundance. And finally, Chris and Cathy’s favourite tomatoes are Sweet Bite or Tommy Toe (cherry tomatoes) for their sweet flavour or Genuwine for a larger tomato. You guys are inspirational and your garden looks like a real haven for good produce! Do you ever allow people to visit your garden? If so I’d be more than happy to have a closer look if possible. I understand the work involved in keeping a productive garden, keep up the great work! Thank you Romano. Yes, Helen did a great job with the article. The garden looks better in the early summer months, so hopefully we’ll organise an ‘open garden’ when the weather warms up. Thanks, Chris. Until then, all the best in the garden. Sounds like a wonderful garden. A place I would like to visit. Great article.